January 24, 2019 – Our time machine transports us back to the Savannah, Georgia, of 1858, where we’ll meet Charles Lamar. Ignoring the law of the United States, Lamar organizes the transportation of hundreds of Africans aboard the yacht Wanderer. This criminal act strikes a hammer blow on the fault lines of America society, marking the first importation of human beings as slaves in four decades. 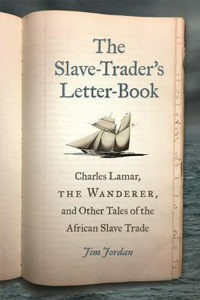 Piecing together the true story with a treasure trove of newly discovered documents is Jim Jordan who brings us The Slave-Trader’s Letter-Book: Charles Lamar, the Wanderer, and Other Tales of the African Slave Trade. Jim Jordan researches and writes about the colonial, antebellum, and Civil War South. He’s the author of the novel Savannah Grey: A Tale of Antebellum Georgia , and its sequel, Penny Savannah: A Tale of Civil War Georgia . In 2018, he earned the Georgia Historical Records Advisory Counsel of the University System of Georgia’s Award for Excellence in Documenting Georgia’s History. Theodore P. Savas — The War Outside My Window: The Civil War Diary of LeRoy Wiley Gresham, 1860-1865.